Nothing interferes with a refreshing shower like a slow-draining bathtub. And that inch or two of water that sneaks up on you is also likely to leave a ring of soap scum and dirt that’s tough to clean. The cause of this scuzzy situation is commonly a clump of hair gathered in the drain pipe a few inches below the stopper. Fortunately, it’s quick and easy enough remove the stopper and banish that nasty bundle. So act on the guidance that follows to unclog the bathtub and enjoy a delightful shower experience again. Snip a straight, 6-inch section of 12-gauge wire or coat hanger with your wire cutters. Grab one end of the wire with your needle-nose pliers, about ½” in, and bend it up to make a small hook. You want about a ½”-wide U-shaped hook so hair won’t fall off as you extract it. Set the hook aside. If you stop your bathtub with a plug, move directly to Step 3. If your tub has a stopper, there are different methods to remove it, depending on type. Removing a drop stopper that you twist half a turn to pop down and close, a screwdriver is required. Usually but not always, a Phillips head will do the job. To take out the stopper, raise it as high as you can. Inside, just under the stopper, you’ll find a small screw on the shaft. Loosen this screw a bit and the top slides off. Set it aside. A push/lock stopper that you push down to lock shut, then push up to release, is easily removed by unscrewing the stopper. The shaft is removable by loosening the screw on the shaft so that the shaft slides up and out. Note: You may need to futz a bit with this screw to get a proper seal when you reinstall the shaft, so be prepared to test the seal and make adjustments. Look inside the drain to see the hair clump. Don your rubber gloves and get a trash bag ready. Insert the hook you made to remove and discard the hair. Carefully cut any remaining hair wrapped around the crosshairs or bars with your utility knife and remove these last bits with your gloved fingers. 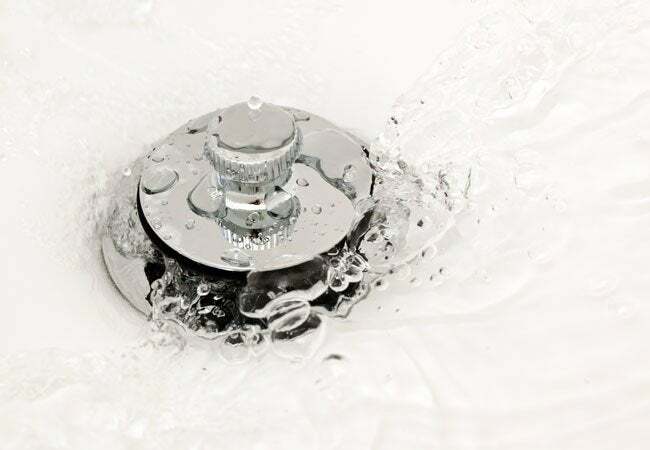 Remove all your tools and stopper parts from the bathtub and then run the water to see how free-flowing the drain is. Is it draining quickly? Move ahead to Step 6. Still draining slow? Pour some liquid dish soap, up to ¼ cup, into the drain and follow that with a bucket of hot water, poured slowly to lubricate pipes and push through any residue. If you’ve got plastic pipes, use hot water from the tap only; anything hotter could loosen the pipes. For metal pipes, boiling water can be used. 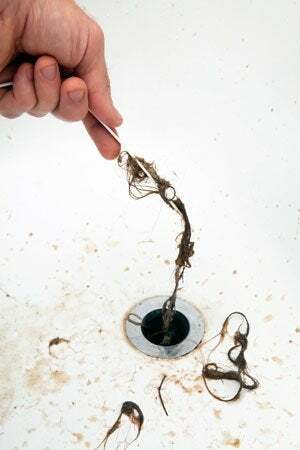 If your drain is still running slow, you might have to use a snake or call a plumber. Replace the stopper and clean the bathtub. Clean and dry your hook, too, saving it for future clog-busting duties. To keep clogs at bay, use a drain cover and avoid emptying mop buckets and other liquids likely to contain dust, dirt, lint, and pet hair into your tub.